To be a mini crane or not to be a mini crane, that is the question. For our Product of the Month for October, the mighty Valla 120ES pick and carry crane. We have gone out on a limb with some unusual connections here at Hird. Comparing a vacuum lifter to the Brazilian footballer, Neymar, was one of them – and it had nothing to do with falling over. So why not have a go Shakespeare as well? 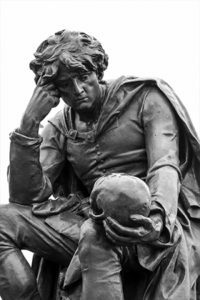 The ‘to be or not to be’ line, an opening to a soliloquy by the brooding and rather miserable Hamlet, is a good place to start when it comes to the Valla 120ES. Is that a mini crane I see before me? The reason being that it has such a large load lifting capacity for a pick and carry crane, it could be forgiven for having a bit of an identity crisis. The Valla 120ES sit-in pick and carry crane can lift 12 tonnes – that is the same as 10 standard Mini cars, and a whole lot more human skulls. 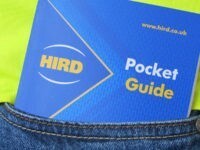 It also has some special features that make it one of the most flexible lifting machines in the Hird mini crane hire fleet. So, while Hamlet is sitting about being all moody, the Valla 120ES can get on with doing a huge amount of heavy lifting for our crane hire customers. 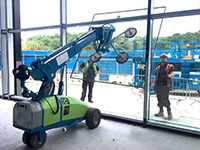 The pick and carry crane is based on the Valla 120E – a very effective crane you can also hire from Hird – but has some useful additional capabilities. Manitex Valla Cranes developed its 120ES with advice from the lifting engineering team here at Hird and after talking to mini crane customers. 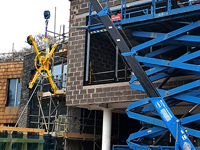 The result was a 120E with an additional boom section, which means the pick and carry crane has a bigger working envelope – the maximum radius has been extended from just over 7m to over 12m. 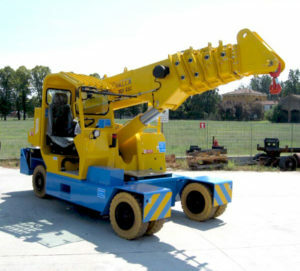 In addition, the jib and fly jib of the pick and carry crane are fully hydraulic – providing greater control throughout the lift, and additional power when, and where, it is needed. As an electric battery powered pick and carry crane, it delivers emission-free lifting and is ideal for low-noise working environments. And, of course, it can operate both indoors and outdoors. The Valla 120ES is also fitted with a 3B6 electronic load indicator system to support safe, productive, and sustainable lifting – and both visual and audible safe lifting alarms. 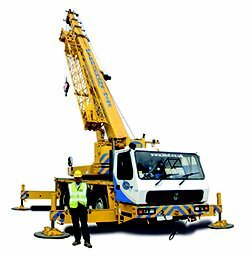 Like other Valla mini cranes, it might have an excellent lifting capacity, but it is truly a compact crane. At only 2.1 metres wide, the crane delivers excellent performance in confined spaces – while the fly jib delivers excellent reach in low-ceiling spaces. Sectors the 120ES pick and carry crane is ideally-suited to include construction (including glass installation and steel erection), machinery moving, facilities maintenance, and manufacturing. As Shakespeare might say, some mini cranes are designed for great lifts, and some have great loads thrust upon then. The Valla 120ES can achieve both, with ease. 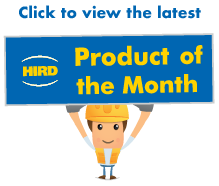 For more information about our October Product of the Month and to see our mini crane hire rates for all our cranes and lifting equipment, call Hird today. We promise not to make a drama about of your lifting project.